Director – Peter Sasdy, Screenplay – John Elder [Anthony Hinds], Producer – Aida Young, Photography – Arthur Grant, Music – James Bernard, Music Supervisor – Philip Martell, Special Effects – Brian Johncock, Makeup – Gerry Fletcher, Art Direction – Scott MacGregor. Production Company – Hammer Films. Three Victorian men who lead upstanding and moralistic lives, sneak out to a brothel on the pretext of conducting charity work. Their pleasure is interrupted by the libertine Lord Courtley who offers to show them far greater pleasures. He takes them to an antique shop where he gets them to purchase Dracula’s cape, signet ring and a vial of his powdered blood. Courtley then conducts a black mass ceremony in an abandoned church. However, when he asks the men to drink the blood, they are disgusted. Drinking it himself, Courtley collapses. The men kick and beat him to death and then flee the scene. However, Courtley’s spilt blood revives Dracula who swears vengeance on the other men for killing his disciple. Dracula then seduces each of the men’s children, making them vampires and turning them against their fathers. Taste the Blood of Dracula was the fifth of the Hammer Dracula films and by unanimous consensus the last Hammer Dracula worth seeing. It saw the entry of a promising new director Peter Sasdy. A Hungarian immigrant, Peter Sasdy had come from noted tv work during the 1960s, including episodes of the sf anthology series Out of the Unknown (1956-71) and the acclaimed BBC adaptation of Wuthering Heights (1970). After Taste the Blood of Dracula, Sasdy was seen as the new directorial lifeblood of the latter day era of the Anglo-horror film but this promise petered out after a handful of horror films of no particular distinction (see below). Come the 1980s and Sasdy was back directing tv work like episodes of Minder, the mediocre Hammer’s House of Mystery and Suspense series of tv movies and the brief light of Adrian Mole mini-series’. Sasdy immediately turns Taste the Blood of Dracula into a different type of Hammer film. He eschews the rich and florid colours that Terence Fisher gave the Hammer film and what has been typified as ‘the Hammer look’ in favour of a grittier more realistic period Victoriana. The sets are darker instead of being brightly lit to show all there is on display. Almost all Hammer films tap it into a a sense of repression emerging from beneath the veneer of British society, where Dracula acts as a metaphorical force to tear polite convention apart before being dispatched. In the opening minutes of Taste the Blood of Dracula, Sasdy makes memorable contrast between Geoffrey Keen beating daughter Linda Hayden for smiling at a boy in church and then heading off to a West End brothel under the guise of ‘doing charity work’. There is crucial difference between Peter Sasdy and Terence Fisher and the sense of Victorian repression that exists in either’s Hammer Dracula entries. 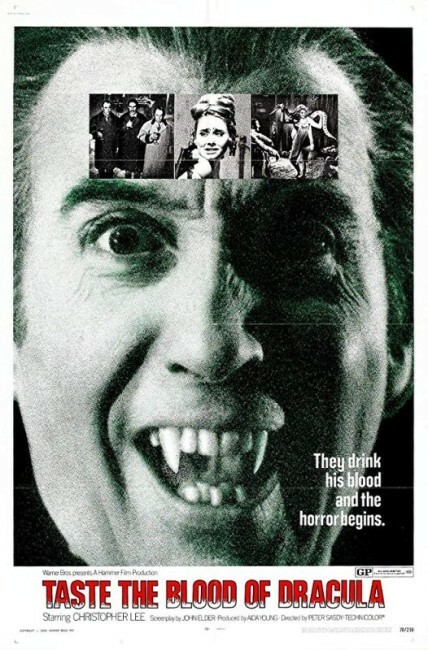 In the likes of Dracula/The Horror of Dracula (1958) and Dracula – Prince of Darkness (1966), Terence Fisher invariably takes the side of society and sees the vampire hunters quashing the emergence of repressed sensuality as just and honourable, whereas for Sasdy Dracula is not so much a force that catalyses repression as one that exposes hypocrisy behind the veneer of virtue that Fisher’s vampire hunters defend. For Terence Fisher, the society is just and there is a sigh of relief as the transgressive is finally banished, for Peter Sasdy the status quo is rent asunder and revealed as false. Sasdy creates some memorable images – the image of innocent Linda Hayden suddenly turning and taking lascivious relish in bashing her father in the head with a shovel. Although the most striking of all images is that of her curled up asleep on the lid of a crypt beneath which Dracula lies in rest. There is a vivid resurrection sequence with dust blowing in to cover Ralph Bates’ dead body and then a mask cracking open to reveal Dracula’s face alive beneath. Taste the Blood of Dracula doesn’t always work – as usual with the Hammer Dracula sequels, the script has difficulty coming up with worthwhile motivation for Dracula. The vengeance angle is not well connected – it does seem overly generous of Dracula to swear vengeance for Courtley’s murder, having not even met Courtley, for instance. Considering that Courtley’s death was necessary for him to be resurrected, it does also seem slightly irrational of Dracula to then swear vengeance on Courtley’s murderers. Further, it makes Taste the Blood of Dracula into something different. It now becomes a film about vengeance rather than one about vampirism. Throughout the focus is on Dracula corrupting the children and turning them against their parents and the usual business of blood-letting hardly even figures at all. Hammer’s other Dracula films are:– Dracula/The Horror of Dracula (1958), The Brides of Dracula (1960), Dracula – Prince of Darkness (1966), Dracula Has Risen from the Grave (1968), Scars of Dracula (1971), Dracula A.D. 1972 (1972), The Satanic Rites of Dracula/Count Dracula and His Vampire Bride (1973) and The Legend of the 7 Golden Vampires/The Seven Brothers Meet Dracula (1974). Peter Sasdy’s other genre outings were:– Countess Dracula (1971), Hands of the Ripper (1971) about Jack the Ripper’s daughter, the ecological horror film Doomwatch (1972), the immortality syndicate film Nothing But the Night (1972), the Nigel Kneale ghost story tv play The Stone Tape (1972), the Satanic impregnation film The Devil Within Her/I Don’t Want to Be Born (1975) and the proto-Virtual Reality film Welcome to Blood City (1977).